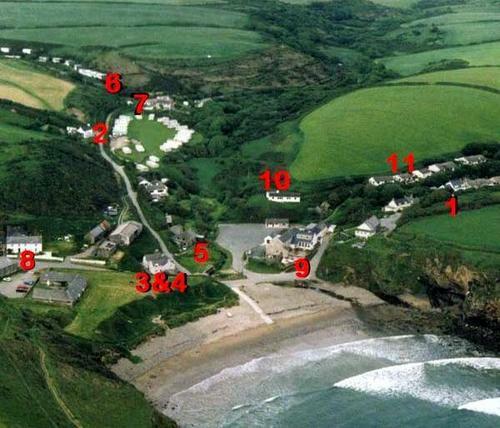 Our cottages are around Nolton Haven's sandy beach. They are fully equipped with television, fridge freezer, microwave etc. Most have oil fired central heating and open log/coal fires. although some have gas or electric central heating. All beds (except bunks) are full size double 4'6" x 6'3" and single 3' x 6'3", and blankets and quilts are supplied. The cottages were family homes and are quite large with some having farmhouse type kitchens with enough room to seat up to 10. (Numbers below) refer to their position on our aerial photo in our picture gallery. 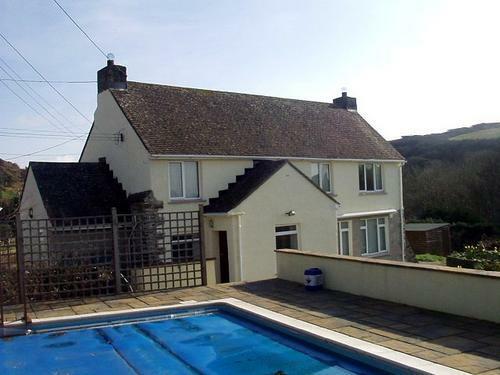 (8) Nolton Haven Farmhouse 8 bedrooms, 8 bathrooms, 50 yards from the sandy beach and 75 yards from the village inn, ample car parking, electric and heating included in the rental. The large farmhouse kitchen has an American type fridge freezer with ice maker, a fridge for wine and beer, two dishwashers, equipped for up to 20, dining table seats 16. Three lounges, the bedrooms 1 family with 1 double bed and 1 single bed, 3 double bedrooms, three twin rooms and one single, with bed linen supplied. Avondale, 350 yards from Nolton Haven's sandy beach, quiet position, 3 bedrooms sleeping 6 in 1 x double, 1 x twin and 1 x set of bunks, well equipped kitchen/diner, lounge and bathroom with bath and seperate shower, all bed linen supplied and the beds are made ready for your arrival. 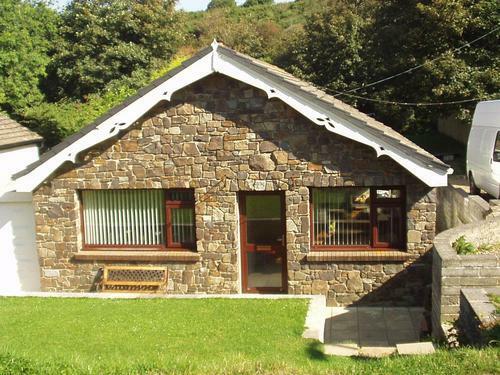 (1) Willow Cottage VisitWales 5 Stars - 3 bedrooms, sleeps 2 to 6. Only four years old this delightful cottage was built by its owner (a local builder as his retirement home) to a very high standard its just 100 yards from the beach Small enclosed garden to rear and parking in front of cottage. 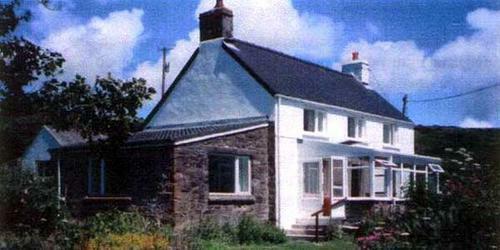 ((2) The Counting House VisitWales 4 Stars - 4 Bedrooms, sleeps 2 to 7/8. It has 3 bedrooms upstairs with the morning room downstairs having a sofa double bed. its has a large living room with sitting one end with TV and video and dining the other with wood burning stove. A new conservatory overlooking the beach leads to the large garden which surround most of the house. It's about 300 yards from the beach. 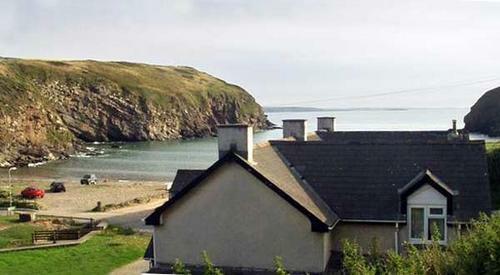 (3) Beach cottage 3 bedrooms, sleeps 2 to 8. The closest property to the beach at just 30 yards has a large farmhouse kitchen, very large lounge with 2 3 piece suites, its about 25' X 16'. Full bathroom upstairs with downstairs shower and toilet. 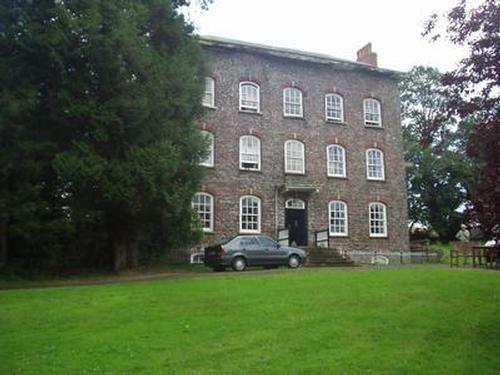 (4) Brooklyn VisitWales 3 Stars - 3 Bedrooms, sleeps 2 to 8. The same as Beach Cottage but with a garage. (5) Furze Mill 4 Bedrooms, sleeps 2 to 7. A converted water mill which was used for grinding gorse as horse feed. 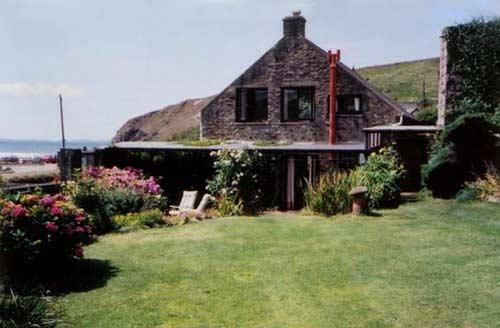 3 upstairs and 1 downstairs bedrooms in this house, extensive gardens to the front (overlooking the beach) and rear (quite secluded), heating in this cottage is by electricity. 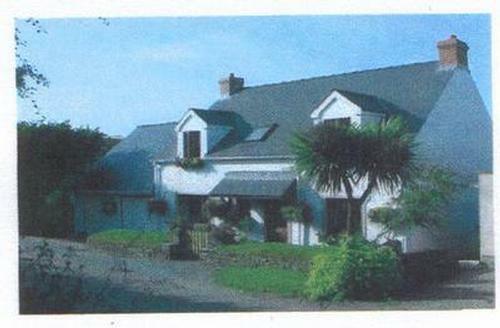 (10) Tyr Felin 3 Bedrooms, sleeps 2 to 7. 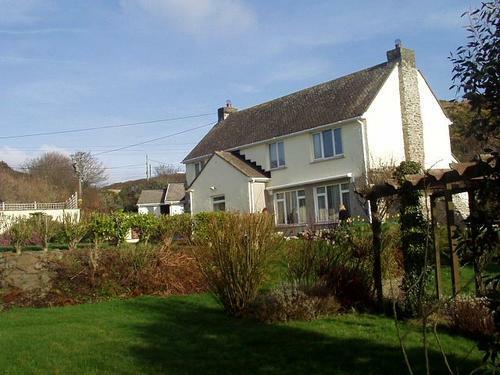 In the centre of Nolton Haven less then 100 yards from the beach but quite private and secluded, spacious with all you need for a good family holiday. It has two toilets and bathroom. Heating by electric with open fire. Ash Cottage and Ramsey View at Simpson West Farm. 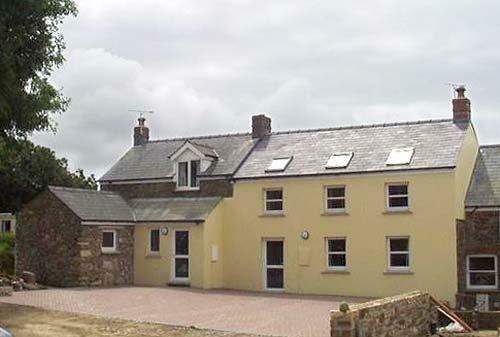 3 Bedroomed recently renovated farmhouse into 2 high quality cottages with fantastic views of St Brides Bay and rolling countryside, miles from the coast. Gas Central heating and log fires, large sun terrace overlooking the coast. Jim and Joyce Canton can arrange B&B in several houses locally. There are cots and high chairs for the use of guests, and usually baby-sitting can be arranged. Special arrangements can be made for many varied interests. Riding holidays in association with the local stables are very popular. The cottages are also a useful base for sea-diving, walking, canoeing and bird watching at any time of year. 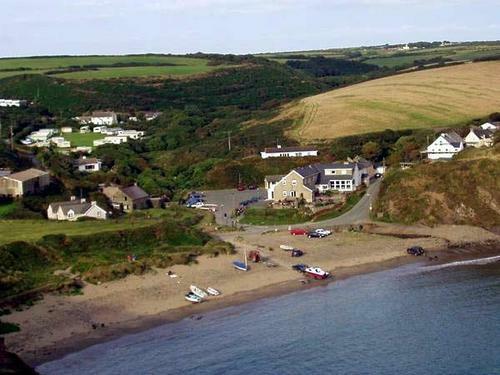 Nolton Haven is a quiet hamlet that lies at the center of the beautiful St. Brides Bay coastline with steep, undulating cliffs and sandy beaches, completely unspoiled but within easy reach of Haverfordwest, the 'county town' and many nearby coastal villages. The whole of the coastline is part of the Pembrokeshire Coast National Park, an area of outstanding natural beauty with a wide variety of natural amenities available to the holidaymaker including the Coast Path (over 160 miles) that passes straight through the Haven, an abundance of wildlife, sea birds, wild flowers and beaches for safe swimming, surfing, boating and fishing. 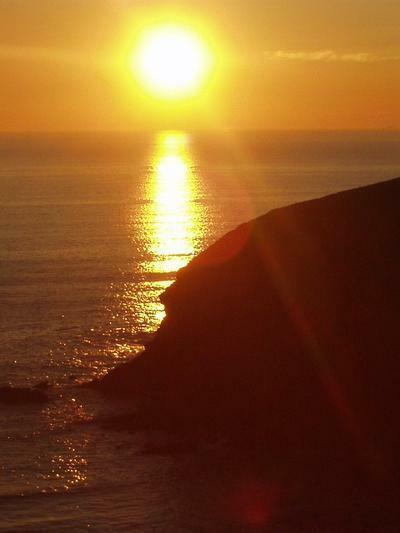 Within a short distance of Newgale, well known for local surf along three miles of golden sands; St. David's, the smallest Cathedral city in Great Britain; the coastal villages of Little Haven, Broad Haven and Solva with a particularly beautiful natural harbour. Interesting places to visit include the Preseli Hills and Cleddau Estuary (both areas of outstanding beauty and within the National Park); woolen mills, craft shops, potteries and a popular boat trip to Skomer Island bird sanctuary. Visitors expecting the noise and crowds of large resorts will be disappointed; the area relies on its own natural beauty and appreciative holidaymakers return year after year.